Aer Lingus has taken to Twitter to poke fun at Saoirse Ronan’s widely panned Saturday Night Live skit. The Irish actress donned a classic green Aer Lingus uniform for the wildly unfunny sketch that is overflowing with Oirish stereotypes and painful accents. It features references to potatoes, Oscar Wilde and, for some reason, dogs. The airline subsequently took to Twitter to troll the sketch in the combative style of US President Donald Trump, writing: "Just tried watching Saturday Night Live - unwatchable! Totally biased, not funny and the Ronan impersonation just can't get any worse. Sad." The tweet was based on Trump's reaction to a Saturday Night Live sketch in which Alec Baldwin plays him. 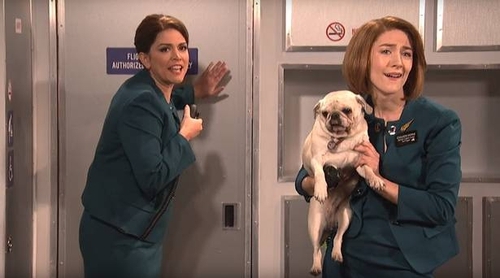 The SNL Aer Lingus sketch drew derision on Twitter, with people deeming it "dreadful", "awful" and "incomprehensible". The 23-year-old actress, who has won universal praise for her upcoming role in Lady Bird, hosted what she called an early St Patrick's Night episode of SNL and her musical guests were U2. "Yes I am very Irish and I have an extremely Irish name, some would say too Irish," she said in her opening monologue. "It’s Saoirse, it means freedom but I’ve got a little problem - it’s spelled wrong, the full typo. S-A-O-I-R-S-E. You can see why people have a hard time. If it was a Wheel of Fortune puzzle, you couldn’t afford it. There’s too many vowels, God bless them, no one has been able to pronounce my name - not even close." U2 performed two tracks, American Soul and Get Out of Your Own Way, from their new album Songs of Experience.